IN AT BOTTOM. NORWEB PEDIGREE. RARITY-6. CAC. Few colonies were given charters that authorized private mintage overseas to avoid rebellion or desire for independence. It seems as though the King was right to worry about the provided freedom. After the Massachusetts Bay Colony challenged the coin restriction successfully, it was not but four months later that they declared themselves an independent commonwealth in October of 1652. Massachusetts was not the only colony to expand beyond their limits to enforce applicable laws. Earlier this same year, Rhode Island became the first American colony to restrict slavery- over two hundred years before the thirteenth amendment was ratified in 1865. Additionally, the Virginia Colony also granted a free African-American man five-hundred acres of land on May 10, 1652. Perhaps the enlightenment could have done without the “enlightened” social contract from philosophers like John Locke. Regardless, these small independent actions taken by the colonies led to the inevitable independence we achieved nearly one-hundred years later. Though the new world was settled in the earliest years of the seventeenth century, the necessity for coins had not yet arisen until mid-century. Due in part to the relatively small populations in early colonies, settlers found natives had no need for monetary commodities and preferred bartered goods and consumables. By 1652 the once small colonies had grown into larger towns and cities that more closely resembled the English towns they left behind years before. At this point it was economically easier to apply value to a small commodity than bundles of tobacco. 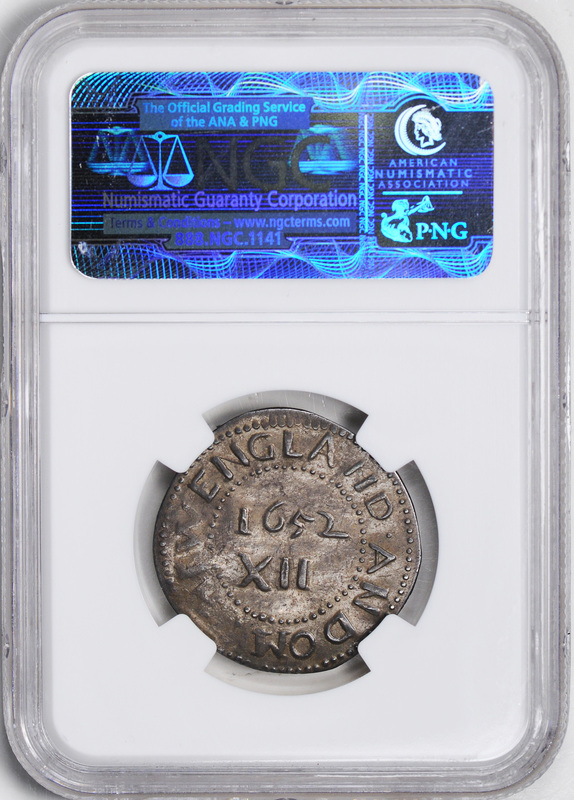 Additionally, colonies were often shorted on English money and many were unauthorized to produce their own coinage- a law put in place by the King who feared he would lose control of distant ruled lands. Eventually it became difficult to keep up with overseas coinage demand, likely due to the frequent English civil wars, so the King authorized mintage to the Massachusetts Bay Colony in 1652. The very first United States mint was nothing too extraordinary, but it certainly achieved a historically important feat. The Boston mint was run by two men, John Hull and Robert Saunderson, who primarily struck silver shillings with the occasional six-pence, three-pence, and two-pence coin . As part of the British Empire, the thirteen colonies could not move away from the English system and would not be able to for another one-hundred and fifty years, which worked fine for the time being. 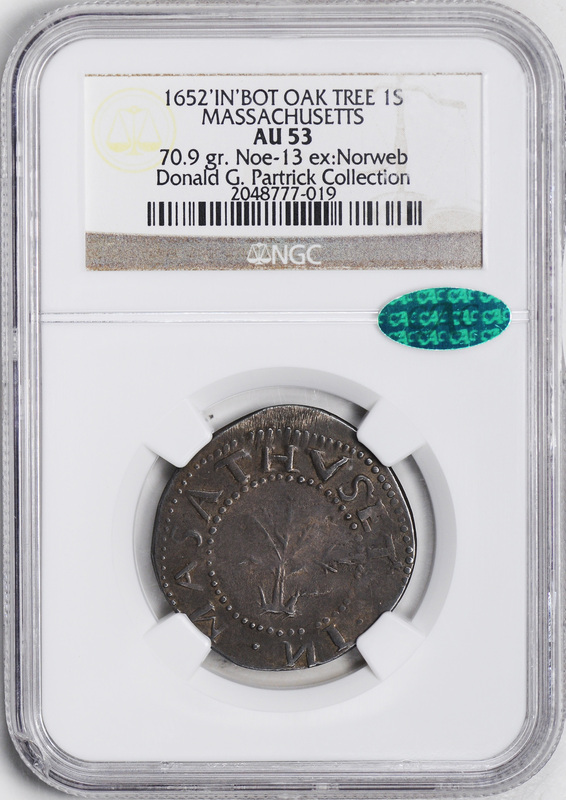 Once authorized, the Boston mint quickly produced the simplest coins to meet demands. These premiere shillings were very plain with “NE” (for New England) on the obverse and a simple XII (to show a denomination of twelve pence) on the reverse. Soon enough the minters realized these coins were two easily clipped for metal or counterfeited, so new designs were added to the coin to prevent this. The first design, which featured a willow tree, followed by an oak tree, and later a pine tree on the obverse, proved to be far more complex and therefore harder to copy. 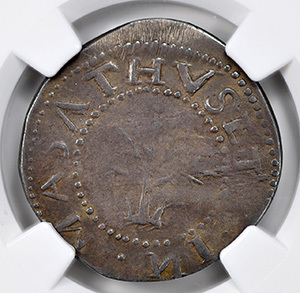 This particular coin features the second tree variety that was added to the coin during the 1660s encircled in the words IN MASSACHUSETTS and small rivets. 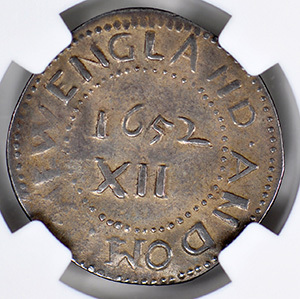 On the reverse, the coin donned the words ANDOM (Short for Anno Domini, long for AD) and NEW ENGLAND which encircled the original date the colony was authorized to mint- not the strike date- and the denomination for twelve pence or XII. Of the three tree designs- all of which had been named centuries after they were struck- are guesses as to the type of tree, the willow is the scarcest, the oak is relatively rare, and the pine tree is the most common. Furthermore, each design has several different die varieties due to manual strikes and unregulated production. The large variety creates a spectacular opportunity for collectors to truly experience the beginnings of American History.